one can never have enough recipes for a well-roasted chicken. we brine chicken and turkey as well, although we only pull out all the stops for the t-giving bird. for a weeknight roast chicken, a soak in salt water is all we bother with. also, i would like to eat more chicken with friends under an archway in france. We brine all of our chicken now except when we are frying. Then we soak it in buttermilk for several hours or overnight. Do you think that brining and THEN soaking frying chicken would be beneficial? I haven’t tried it (the double soak) yet, but have thought about it. We brine the chicken strips for 7 hours before coating it with egg wash and corn starch and frying it. It turns out better. We add home-made spice powder, garlic, salt and sugar in the water to make the brine. I think you can add the spices and herbs in buttermilk instead of water. Double soaking makes no sense. Combine the both instead. 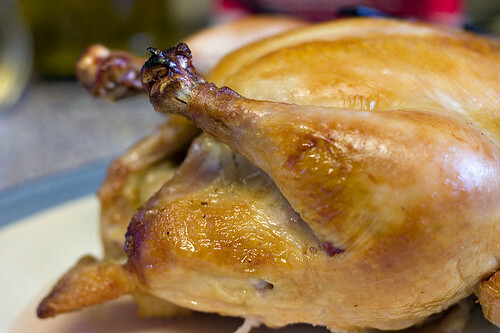 I love to brine turkey and chicken, although I haven’t tried the whole bird yet. This one sounds delicious! michelle – The only problem with too many roast chicken recipes is that there isn’t enough time to make them all. I’d also highly recommend eating roast chicken with friends under an archway in France. DocChuck – I wouldn’t recommend brining and soaking in buttermilk. The soaking in buttermilk is brining (particularly if you add salt to the buttermilk). You’re likely to just end up with the overly salty chicken. PaniniKathy – I also like brining chicken and turkey (whenever I can plan far enough in advance to do so). I also tend to brine pork (really important) and shrimp (which can be done quickly and really improves the texture of the shrimp). I like this brine for chicken and turkey because the flavors of the brine compliment the flavor of the poultry and don’t overpower it. 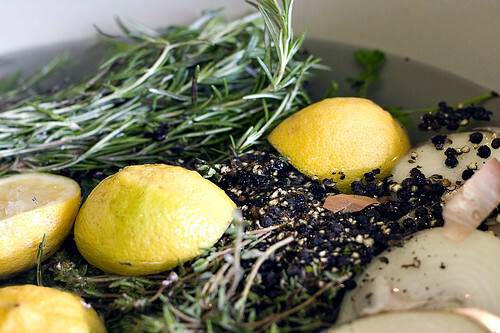 this brine sounds similar to one i have used….leaving out the rosemary and adding 3 jalapeno peppers halved lengthwise. it adds a fresh-heat, for lack of a better term. everyone who’s eaten it has commented on it but none can identify the source by taste. Allow me to answer my husband’s inquiry, as I believe your answer was off the mark. we are living apart, or I would answer him directly. When a protein is properly brined, the salt helps denature the protein strands, allowing the salty brine to flow into the meat’s cells. It will flow into the meat until equilibrium is achieved. After that no more liquid or salt will enter the meat. So soaking in buttermilk after brining will possibly give it a bit of a tang or even make the meat more tender (marinating in dairy is one of the only ways to truly tenderize meat) but it will NOT make it more salty. What about using dried herbs? I’ve got a lot of those, so it’d save a little money for me. How much of your usual supermarket dried stuff would substitute for the bunches? Typically, you’d substitute 1/3 the amount of fresh herbs with dried herbs (i.e. replace 1 tbsp fresh herbs with 1 tsp dried herbs). In this case, my guess would be a tablespoon of dried herbs would probably be best. However, I haven’t tried it. Fresh herbs will also give much better flavor than dried herbs. Thank you sooo much for making this recipe available. Rosemary is, above all others, my favorite herb. I even grow four different types of rosemary on my bedroom window still. While process of brining meats has become a discovery to me early this year, combining both rosemary and brine was a challenge to find around the inter-web. Even in serious culinary sites by actual professional chefs. Finding this recipe has been a wonderful resource; from then on, Im still experimenting with this, like different sugars, pepper, and especially rosemary. Thank you so very much for making this recipe available in this blog. Though this is the only thing I looked up on your blog, I’ll make sure to flip through it.